This year’s edition of the Poetry Festival of Barcelona is coming to a close. 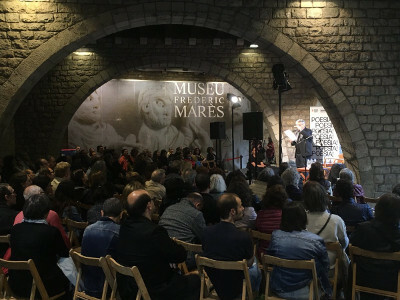 Among the many events that have been taking place in the Catalonian capital, a highlight was the joint poetry reading by Josep Piera and Bernardo Atxaga on Saturday, May 12. The two poets took the stage at the Frederic Marés Museum under the evening’s theme Cants i encants. D'Obaba a la Drova. In addition to being friends, Atxaga and Piera share other similarities, including being creators of very personal yet recognizable universes. Atxaga is known for his fictional Basque town Obaba, while Piera, who hails from Valencia, writes lyrically about La Drova valley in his own work. The two poets immersed their audience in these two worlds at the evening reading. The Poetry Festival of Barcelona is an advocate for freedom of expression, with more than 107 poets participating in 28 poetry events organized throughout the week.